Normally we associate “advancement” with “up” – we “climb the ladder”, “race to the top”, “reach for the stars”… Vertical Drop Heroes HD turns that on its head, with gravity leading the way instead. The premise is simple – your hero ventures into “many strange and fantastic lands”, seeking to fulfil a prophesy of a great hero who will find a secret to existance. Except, as the game’s story screen explains, everyone in a fantasy land thinks they are the great one, but most end up in a goblin’s digestive system. This will also likely be the fate to most of the heroes you lead to their deaths, as VDHHD is built around mechanics that mean most characters will fail but help gain an advantage for the heroes to follow. Described as a platformer with roguelike elements, it definitely fits the first description better than the second. Each level is built out of a random layout of blocks, with you jumping and falling down to each area’s locked exit, guarded by a boss. 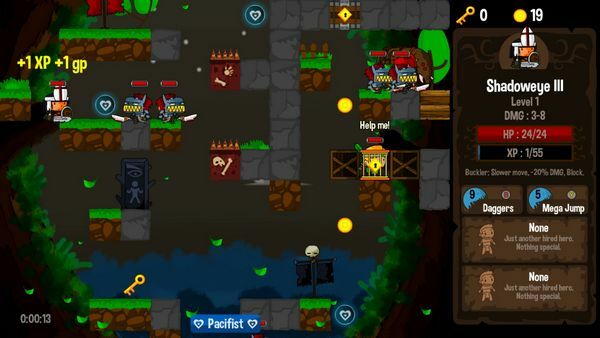 On route, you’ll be having to fight – or avoid – numerous types of monster, as well as decide how to navigate by alarms, spike traps, collapsing floors, reach keys and treasure boxes, and so on. As far as being roguelike, however… it’s more the modern definition of “roguelike” as being procedurally generated with permadeath. Although that isn’t as penalising as it may sound, thanks to the way characters are generated. On starting up you are presented with a choice of three brave, doomed characters, each with a randomly selected weapon, two active skills and two passive abilities, all picked from whatever selection you’ve unlocked (on playing the game for the first time, characters may not have any abilities at all). On dying, another character with the exact same set of characteristics will be available, along with two fresh choices – a good way of sticking with something that worked. As you venture into the depths, you will collect gold, either as loose coins or gems – both gained from both monsters and treasure boxes – which can be used in various ways to improve your chances. 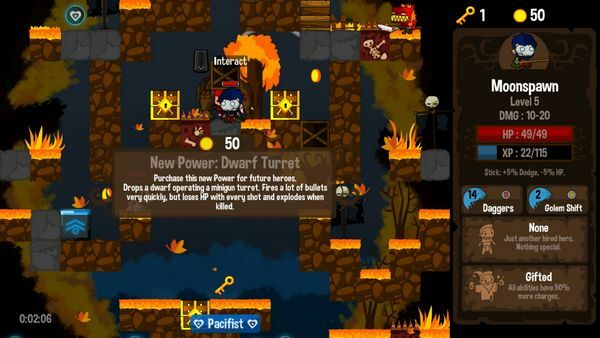 Merchants can be found, ready to sell new skills and abilities; teleportation shrines can be paid for, unlocking levels later than the first to begin on; and once that cave troll boss is done pummelling your corpse, any coins you were carrying can be spent at the starting temple on permanent upgrades to your damage, health, or pacifist abilities. And at this point it’s worth mentioning that fighting your way through the dungeon may be the easiest route, but not always the most rewarding. 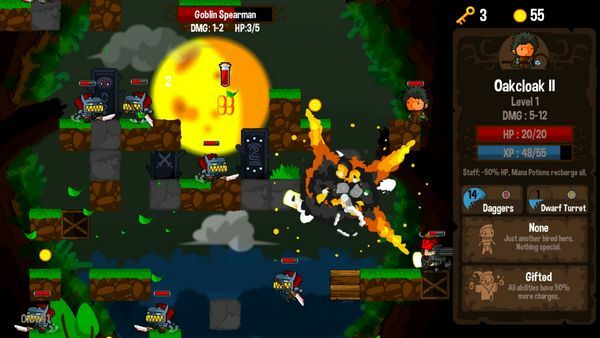 You begin each level in pacifist mode, and remain that way until you kill an enemy; as a reward for this – and a way of allowing you to still advance your character – the level will have pacifist orbs to be collected, giving you a boost of gold and XP. There are also still some sneaky ways of dealing with monsters, ranging from rescuing imprisoned heroes to do the fighting for you, letting traps thin out the enemy numbers, and even a small number of skills that are able to defeat the critters without considering you responsible. It’s an interesting approach, and working out how to avoid the fights in a level does make you play in an entirely different way. It’s a fun game, although one that feels aimed at short sessions rather than a prolonged playthrough. Finishing each level tends to only take a few minutes, and even a successful run to the end of the tenth level is likely to take around half an hour. In the longer term, there are a lot of skills to unlock session-by-session, and even though some are clearly better than others it can provide motivation for another stroll into the unknown. Perhaps the biggest problem the game has is that, while it throws together elements of platformers and roguelikes, neither on these will feel like the best of their genre. The platforming works well enough for navigation – with some nice touches like being able to jump in mid-air if you walk off a ledge rather than jump from it – but doesn’t feel like it could stand against some of the greats. Likewise, the roguelike elements tend towards randomisation of familiar elements, and while playing experience will help you learn to handle these best it can still feel a touch shallow. It all rolls together into a game that is fun and has character, but stands as good rather than great. The product under review has been purchased by the site or reviewer and has not been supplied by a third party. Please see our site review policy for more information.